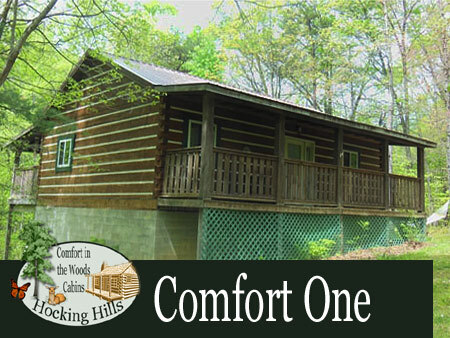 Hocking Hills Cabins - Comfort in the Woods-Within 5 miles of Old Man's Cave and Cedar Falls! 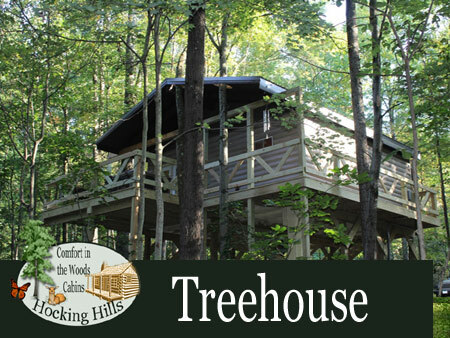 Five spacious secluded properties in the heart of Hocking Hills featuring our new Treehouse and Four genuine log cabins. Each has a hot tub, fireplace, vaulted ceilings and leather furnishings. Comfort One accommodates four people comfortably. This Hocking Hills cabin is perfect for a Couple or a Family. It is a fully furnished one-bedroom cabin nestled on twenty wooded acres. This Hocking Hills cabin is perfect for the family with plenty of board games, kid movies and a large deck. It features a fully equipped kitchen, satellite TV and DVD, electric fireplace and hot tub on a covered back deck. 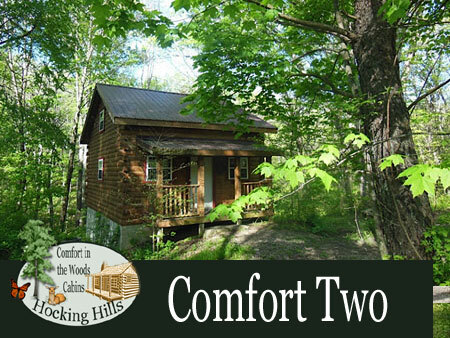 COMFORT Two is a romantic couples cabin. This beautifully built log cabin is perfect to snuggle and reconnect with your special someone. It is secluded on ten wooded acres and fully furnished with a large loft bedroom overlooking an open family room area. It features a fully equipped kitchen, satellite TV and DVD, electric fireplace, and hot tub on a covered back deck. 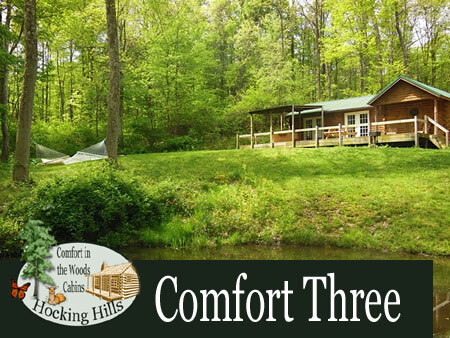 COMFORT Three is the perfect family cabin and accommodates five people. This cabin is situated on ten acres with a small catch and release fishing pond and large grassy yard for families to enjoy recreation time. The kids can snuggle under the lantern with a book in the sleeping loft while the adults take the bed in this large open space cabin. This cabin is perfect for families or couples. It features a fully equipped kitchen, satellite TV and DVD, electric fireplace, and hot tub on a covered back deck. Comfort Four is a brand new 2 bedroom log cabin. It sleeps 6. This specious new cabin features a large loft with high vaulted ceilings and modern style furnishings. Enjoy the privacy this cabin has to offer while reconnecting with friends and family. All the comforts of home in the woods! It features a fully equipped kitchen, satellite TV and DVD, electric fireplace, and hot tub on a covered back deck. The Treehouse is settled on a 20 foot high platform nestled in a canopy of trees. The deck wraps around the entire treehouse with the hot tub overlooking a stream. Enjoy the bird’s-eye view as you look down upon the deer and wildlife strolling along the property. One night available with approval at full price. 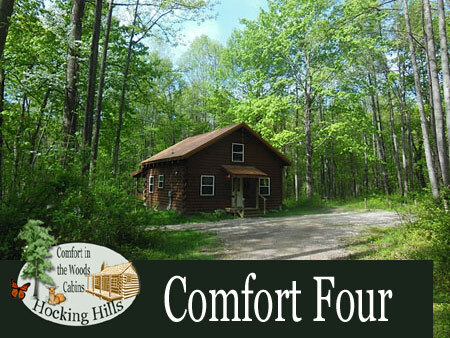 Comfort in the Woods has over 30 private wooded acres. Our cabins and Treehouse are situated so that you have privacy from all other cabins. Each property has a unique layout, decor and view. All of our properties have a hot tub, electric fireplace, fire ring, and fully equipped kitchen. Linens and towels are provided. The cabins are within 5 miles of Old Man's Cave and Cedar Falls!